The ability to turn certain parts of Windows 8.1 on or off goes back to the days of Windows 3.1. Once upon a time, the feature was useful to reduce the bloat — the footprint — of Windows. Now, that isn’t such a compelling reason. 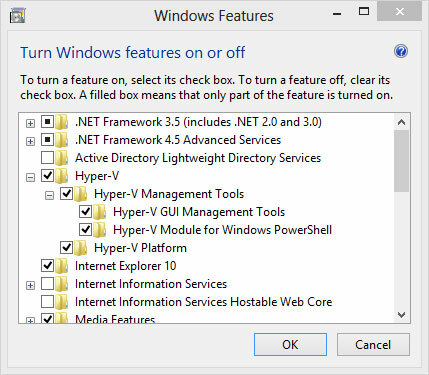 But it’s become an interesting location for adding gonzo programs like Hyper-V, which piggyback on the Add a Feature approach to run heavy-duty installers. Most frequently, parts of Windows get blocked off in order to minimize the chances of you shooting yourself in the foot. The theory goes that if you’re smart enough to turn on a feature, you’re smart enough to use it. On rare occasions, you may want to intentionally disable a part of Windows because you don’t want to deal with the consequences of having it available. People used to disable Internet Explorer to minimize their chances of getting infected with IE-borne viruses — although it’s highly debatable whether they actually accomplished anything by doing so. Bring up Control Panel by swiping on the right side of the desktop and then choosing the Settings charm and picking Control Panel at the top, or right-clicking the Start screen in the lower-left corner and then choosing Control Panel. In the lower left, select the Programs category; then in the Programs and Features section, tap or click the Turn Windows Features On or Off link. The Windows Features dialog box appears. Enable or disable Windows features by selecting or deselecting, respectively, the appropriate boxes. Note that you can tap or click the + sign next to some features to allow you to enable or disable specific pieces of the programs. The pieces of Windows get added or blocked immediately.